All our guides are university graduates, majored in History, and the Jewish History of Spain. All our guides speak English, Spanish and Hebrew fluently. Pre-designed or custom made tours. You decide! Can’t decide between two tours? Book both and save 10% on your second tour. We specialize in providing rich and personalized experiences through private, guided walking tours in some of the most historically and culturally vibrant cities in Europe. With its incredible diversity, Barcelona – more than almost any other city – is a place that is best seen on foot. Come with us on one of our Barcelona walking tours and explore the beauty of this city! I just wanted to write and say thank you so much for arranging a wonderful day for us. We truly enjoyed the tour with Adi, who led us through Girona and Figueres. He was sweet, flexible, and very knowledgeable about the areas he was showing us. 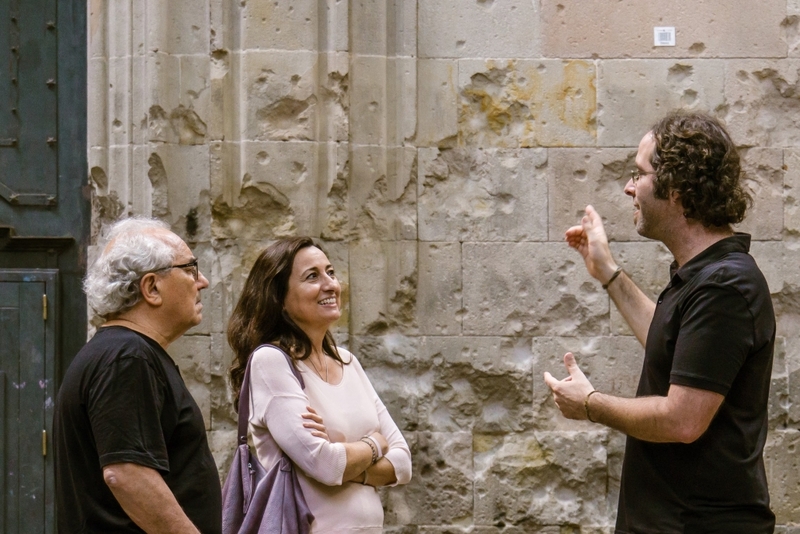 It was a pleasure to be able to walk around and learn about the area, the artists, the Jewish community, and any other tips he provided us regarding our stay in Barcelona. I will definitely be recommending your tour guide company! An insightful tour through the Gothic quarter about the history of Spain in general and the history of Jewish people who lived there. Dina has in depth knowledge on history and is clearly passionate about it. She conveyed this complex history story simply, from different points of view, knew to answer questions and connect the timeline to other historical events around the world in general and to Jewish events in particular. Dina’s map reference as well and standing there on the stone floor conveyed the history in a very personal and real way. Dina shows you how Jewish life in Spain was good & flourishing – the strong Jewish presence in Spain of scholars like the Ramban. Before the horrible inquisition in 1492 that only ended over 300 years later. Hi Michal, just wanted to let you know that we had an absolutely wonderful afternoon with Adi. He is a great guy and a great guide, and now “chaver” for life. I left a nice review on TripAdvisor. Todah Rabah once again! All the arrangements for Joy and Scott Silver worked out really well and this would have not been possible without your multiple personal interventions. They had a great time exploring Barcelona’s Call and Gothic Quarter with Adi. It has been an absolute pleasure working with you and I thank you for making me shine. I hope that Joy and Scott spread the word and that many more opportunities to work together arise in the near future. Barcelona Dreaming offered one of the best tours on our recent trip to Spain. We originally had a few couples going on this tour of the Jewish quarter. When they cancelled out, Barcelona Dreaming arranged to include us with two others to form a small walking tour. The tour was supposed to be 2 hours, but our guide Adi Mahler did not rush us and with all the information and stories about each site, it ran almost 3 hours. After several tours that week, I believe Adi was the most prepared and knowledgeable of any guide we used. If you have the time this is a great tour. Yitzy and I much enjoyed our tour last week! Our two days gave us a little flavor of the great city you live in. Your knowledge gave us great insight into the history of Barcelona. Hope to be back there soon. Just wanted to say thank you for your interesting tour on Tuesday we really enjoyed it. We are leaving shortly for Venice and will have fond memories of our stay in Barcelona. Our two hour walk with Adi was a real pleasure. He was so Informative, and friendly and has a great sense of humor! We enjoyed it thoroughly and will definitely do a review on TripAdvisor. Please thank him again and we wish you both a happy Pesach! !